Mike Ashley is now in his twelfth year of owning Newcastle United. Once/if we get past May, it will be into his thirteenth year – unlucky for all of us! Writer Jonathan Drape-Comyn has gone through the Mike Ashley reign since May 2007. In 2017, Newcastle United’s offices were raided due to an HMRC investigation into tax fraud. Lee Charnley, the man who the club have confirmed runs Newcastle United, was arrested. HMRC told the court that they believed Newcastle United had “systematically abused the tax system” by secretly paying players and agents during transfers. Further details regarding the ongoing HMRC investigation have not yet been made open to the public. This could be a long one of course, and Mike Ashley’s treatment of Rafa Benitez has been well publicised in the press. There is the obvious issue of transfers and investment. For me though, the big one, is that Mike Ashley has allowed Rafa Benitez, the manager of his football club, to be derided in the national media. In some cases, friends and associates of Mike Ashley have been the ones doing the disparaging (Wise, Ferdinand, Keys, Sherwood, Jordan etc). At no point during Rafa’s time in charge has Mike Ashley allowed him to invest any money into the squad. In his first summer in charge, Benitez made a £30 million profit on transfers. In his second summer, Benitez spent £43 million, and roughly received £25 million on transfers. Last summer, Benitez spent £22 million and received £44 million in sold players, with Newcastle pocketing £22 million overall. Of all the lies Mike Ashley has told, that one is arguably the worst, and most damning. Benitez has been hung out to dry by Mike Ashley, and he has been hung out with his hands tied behind his back. The most qualified manager in the history of the football club, disrespected and lied to. More lies: some big, some small, can be found here. Mainly thanks to the brilliant work from Chris Holt. Leicester City’s late owner made serious attempts to invest in the local area. Manchester City’s owner is another one who invested heavily in the local area. The same goes for Liverpool’s owners who in recent years have invested heavily in the area around Anfield. In fact, if anything, Mike Ashley has only had a negative impact on the City of Newcastle. This is highlighted by Newcastle Central MP Chi Onwurah’s determination to bring about a recent debate in the House of Commons on his running of the club. Chi commented that football is “part of our culture”and with Mike Ashley being seemingly intent on destroying the football club, you could say he is going some way to attempting to destroy the culture of a whole city. 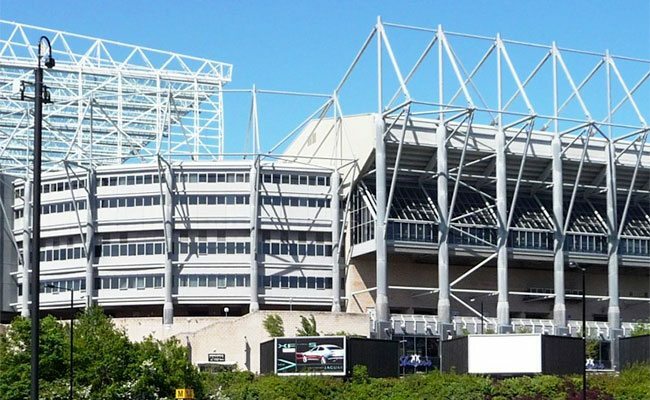 Our beloved stadium is in a desperate state..
For any fans who use social media, they will be well aware from photos uploaded of the neglect St James Park has faced over the past 11 years. This ranges from a general lack of cleanliness, both inside and outside of the stadium, as well as many instances of signs, posters and announcements that are out of date by months or even years. OH! and let us not forget that the last time they did have a clear out at SJP, the club decided to throw out pictures of Sir Bobby Robson, the late Gary Speed and Alan Shearer into a skip. Pictures of a team, and a man like Sir Bobby, thrown into a skip. How symptomatic of the man Mike Ashley is, and the people he employs at Newcastle United. Another Mike Ashley lie is the claim that Newcastle United are one of the cheapest Premier League clubs to watch. Last summer, Mike Ashley raised ticket prices in every stand with no justification at all. In some instances, fans would end up paying more than 20% what they paid for their season ticket in the previous campaign. To sit in the Gallowgate or Leazes, adults had to pay £628 for a season ticket, whilst standard seats in the East Stand and Milburn were £772. I would encourage anyone to read this Mag article by Lewis Jones who describes how difficult it is for him to take his family to the football under Mike Ashley. This may seem like an obvious one but it is important to stress that this is not an issue which has only arisen under Rafa Benitez. Of course the likes of Keys, Wise, Ferdinand may go back to the summer of McClaren, or certain January windows, without providing any context. The Newcastle United playing squad has suffered from underinvestment for 10 years now. From not investing during their first spell in the Championship, to not spending the Andy Carroll money, to relying on cheap French imports, to refusing to improve a team that somehow finished 5th, to going a whole year without making a permanent first team signing, to relying on loan signings. It is beyond belief. Have I mentioned Newcastle United’s Purple Players Theory? You can read about it here. An action that has largely been under-reported but has incensed Newcastle United fans more than most things, is in regards to the Strawberry Place Development. The area – the land around St James metro station – is a personal development by Mike Ashley. This essentially makes it almost impossible for Newcastle United to extend the stadium, given the well publicized logistical problems of extending the East Stand, and the fact that an extension on the Milburn and Leazes stand is not feasible. By doing this, Mike Ashley has placed an infinite cap on the size of the stadium, and thus the potential the club has to grow in the future, regardless of whether he is here or not. Under Mike Ashley, Newcastle have never made it past the 5th round of the League Cup. It is a record in a cup competition that is not just poor, but when given the context of specific seasons under Mike Ashley, makes weary reading. From losing 2-0 to Arsenal’s youth side to throwing a game against Manchester United with a weakened squad (in which Newcastle fans were charged £49 for a ticket)… it might not seem too bad until you take into account embarrassing defeats against Peterborough, Sheffield Wednesday and twice against Nottingham Forest. The FA Cup record has received a lot of attention but lets not forget that the policy of throwing cup games extends to all cup competitions under Mike Ashley. Newcastle United, six times winners and thirteen times finalists have never reached the 5th round of the cup under Mike Ashley. They have been knocked out by Hull City, West Brom, Stevenage, Brighton (twice), Cardiff, Leicester, Watford (twice) and of course, Oxford United. In the 11 years previous to Mike Ashley’s reign Newcastle reached two finals, two semi-finals and two quarter-finals. Again, a quick comparison is all that is necessary. In the 11 years before Mike Ashley, Newcastle United reached the UEFA Cup QF in 1997; Champions League GS in 1997; played in the UEFA Cup Winners Cup in 1998; Last 32 of the UEFA Cup in 1999; Last 16 of the Champions League in 2002; Champions League Qualifier in 2003; Semi-final of the UEFA Cup in 2004; QF of the UEFA Cup in 2005; Last 16 of the UEFA Cup in 2007. In the 11 years since, Newcastle have played in Europe once and been relegated from the Premier League twice. In the 11 years before Mike Ashley, Newcastle United finished 2nd, 13th, 13th, 11th, 11th, 4th, 3rd, 5th, 14th, 7th, 13th. In the 11 years since, Newcastle United have finished 12th, RELEGATED, Championship, 12th, 5th, 16th, 10th, 15th, RELEGATED, Championship, 10th. They are currently 17th in the table and in danger of a third relegation. The failure to break the club’s transfer record acts a symbol of the neglect Mike Ashley has shown the club throughout his tenure. Then there is Newcastle United who have been a Premier League club for all but three PL seasons… £16.5m 2005. Matchday income in the recent ‘Deloitte Top 20’ showed that Newcastle United’s matchday income hasn’t been lower since 2000. Since Mike Ashley bought Newcastle United, it has been shown that 3 out of 4 Premier League regular clubs that had originally had a lower matchday income have now overtaken Newcastle United in terms of matchday revenue. Everton remain behind but are pursuing a new stadium that will lead to them overtaking Newcastle who have no plans to improve capacity. Attendances, unlike matchday income, are not at their lowest since 2000 and ticket prices are up, but the box office price isn’t necessarily what the club get. Tickets are sold at a cut rate by the club to colleges, businesses and tour operators. They pay a fraction of what a fan visiting the box office would and that fraction gets smaller as the club deteriorates. At the nadir, Newcastle United’s commercial income was down by £14m. The club have said that £6m of this can be accounted for by outsourcing but many other losses have done damage. Free advertising for Ashley’s shops has contributed and many presume an opaque retail contract also puts the interests of his shop (and clients like Puma) ahead of the club. You only have to walk through the front door of the club shop for this fact to slap you in the face. There are no longer any club shops in the Metro Centre or Eldon Square. Concerns from politicians and fans about where the money goes and a significant drop in the quality of goods, combined with performance on the pitch and in the boardroom, has inclined supporters to stop spending at the club shop too. Ultimately those sums are dwarfed by sponsorship and Ashley’s taken the club from one that was paid handsomely to promote multinational banks and media companies to one that struggles to compete for deals from bookies and payday loan companies. According to Forbes list of most valuable football teams in the world, 11 years ago, when Mike Ashley took over, Newcastle United were ahead of Tottenham and Borussia Dortmund in terms of club value. Newcastle United were only two places behind Liverpool in the list. Newcastle United were only four places behind Barcelona in the list. Newcastle United were the 13th most valuable football club in the entire world. I could not find where Newcastle United are now, but they no longer feature in top 20. Do Newcastle United even have a Supporters Liaison Officer? For me personally, the most telling thing about Newcastle United is that they no longer have a Supporters Liaison Officer. If any fact, or stat, or quote shows Mike Ashley’s utter contempt for the supporters of Newcastle United then it is this. Newcastle’s previous SLO was Lee Marshall, who is now the club’s Head of Media and Content. His LinkedIn states that he has not been the club’s SLO since July 2016, over two and a half years ago. We can therefore conclude that Newcastle United has been without a SLO for over two and a half years. The club have been asked on multiple occasions who is the SLO, to which there has been no reply. A shambles. Chris Holt provides an accurate description as to why the club’s ‘fans forum’ is nothing short of a sham. Now you may think the ‘no respect for Newcastle fans’ line has been exhausted by now, but I can assure you that it has not. Firstly, a look at other clubs who have given free travel to fans; Bournemouth, West Ham United, Leicester City. Meanwhile, Leicester City provided free breakfast, parking and scarves for fans travelling to away games. Additionally, Southampton recently gave fans free beer before the game, while Huddersfield fans were treated to a free beer by one of their players away at Southampton. It was only a few years ago that Newcastle United told my Dad, that due to new rules, he was deemed no longer ‘disabled enough’ to be entitled to his disabled season ticket with his carer. He lost all of his loyalty points after 35 years of following the club home and away. He has never been back. It was only a month ago, that Newcastle United banned me from buying tickets for any football matches because I had previously used multiple devices on my account (iPad, Computer, Laptop, Phone, Telephone) to buy tickets. It was only last week that a steward was sacked for getting a photo with the players. Only at Mike Ashley’s Newcastle United. While the topic is relevant, we cannot ignore what Mike Ashley has done in previous January transfer windows. Mike Ashley has bought 3 players in 6 years. It has been 3 years since a player was bought. It is also important to note that the time Mike Ashley has attempted to spend any money in a January transfer window is when the threat of relegation, and therefore a personal financial hit, has loomed large. It is often cited that Mike Ashley saved Newcastle United. It is said that the club was in crippling debt at the time he took over, and he saved them from becoming another Leeds United or Portsmouth. Mike Ashley inherited £76 million worth of debt when he bought Newcastle United. He has since grown that debt to roughly £144 million (although was recently confirmed by the club that he has recouped an unknown amount of this figure for himself). This means that Mike Ashley has grown the club’s debt by almost the same amount as the debt he inherited (£76-£68m). Newcastle may not have turned into a Leeds United or Portsmouth, but with both sides sitting at the top of the Championship and League 1, come next season, Newcastle may be a league behind Leeds, and in the same one as Portsmouth. Mike Ashley first put Newcastle United up for sale on the 8th June 2009 for £100m. Since then it has been reported that Profitable Group (Singapore), Freddy Shepherd, Barry Moat, Geoff Sheard (USA), Anil Ambani, to Saudis, to Emiratis as well as many unidentified groups from around the globe had progressed to the due diligence phase to buy the club. There have been open letters, London curry houses, meetings and TV interviews, yet Mike Ashley is still here. He continues to ‘demand’ £300m. Many have given their reasons for the breakdown in a takeover including Mike Ashley’s “lack of communication and response” (Profitable Group) to the long drawn out process of Amanda Staveley and Peter Kenyon in recent years. Was the club ever for sale? I don’t think so. Just like the sale signs when you walk into Sports Direct, it will never end. Newcastle United fans are more divided than they have ever been. Social media is often filled with fans arguing and questioning one another. In some cases, fans spend more times arguing about ways to protest Mike Ashley than they do actually protesting Mike Ashley. All any fan wants is for Newcastle United to be the best club they can possibly be. However, Mike Ashley has created a split, or a rift between fans that may not ever be fully repairable. At Sports Direct he has been accused of unsafe health conditions at his company’s warehouse; sweatshop like working conditions; taking advantage of poor families through the use of zero-hours contracts and not rewarding staff for overtime. At USC, staff were given 15 minutes notice of redundancies. Mike Ashley was recently forced to attend a select committee in-front of MP’s to answer their questions. That is just the half of it, trust me! Then there is Glasgow Rangers which you can read about here. Ah yes, the last one! The one we had all forgotten about! It has now been over a year since Peter Beardsley has been on suspension by Newcastle United on full pay over bullying claims. Beardsley has denied all allegations.